“Violating” means stealing money directly out of your paycheck (Income Tax, Social Security, Medicare, Disability, Unemployment etc) or forcing you to pay for other things (Property Tax or Obamacare). It’s forced compliance – your money, or your life. 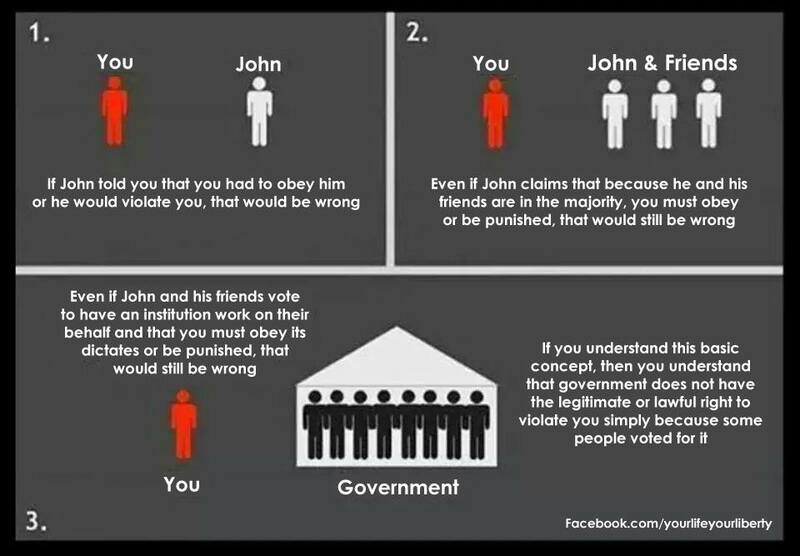 And calling taxation voluntary is like calling a prison sentence voluntary: you can voluntarily go to prison, or you can be hunted down like a dog and physically forced to go to prison. What I find interesting that in my friends comments was the assumption that taking more than 1/3 of peoples income directly out of peoples paychecks is a “law”. And because it is a law, that means simply because you are a law abiding citizen, you should not question it. One of those questions could be on a legal basis – is this law actually enforceable. We can debate if the 16th amendment was properly ratified or if Congress even HAS the constitutional power to tax labor (or income from labor). We could also question the assumption that most people have that wages are actually income (if labor is exchanged for wages, its not technically income) or debate whether taxing wages violates individuals’ right to property and on and on. Instead of exploring if these laws are legal and enforceable, I think a better question to ask would be what are the purpose of laws? Were laws designed to be used to force people to do things against their will? And on a broader scale, what is the purpose of government? It is the “collective organization of the individual right to lawful defense” of the natural rights of life, liberty, and property. Our constitution was designed to limit the powers of the government. It also spells out how the government is structured, creating checks on its power and balancing power between the different branches. The founders were careful in creating this because they understood that the only entity that can take away the people’s freedom is their own government, either by being too weak to protect them from external threats or by becoming too powerful and taking over every aspect of life. The founders created a constitutional republic where people have no obligation to the government; instead, the government is a servant of the people, and obliged to its owner, We the People. Today, this simple premise has been flipped on its head. The purpose of law was to preserve freedom and moral agency, to protect our rights. Laws were never designed to be used as a political tool to force others to support an agenda – whatever that agenda is, even if it has good intentions behind it. Laws were not meant to be used as a tool for legalized plunder, to force other people to do things against their will. The founders did not envision a world where the law is perverted and used to extract wealth from people and then given to others. Instead of protecting our rights, the law has turned to plundering them. A free country means spending your own hard earned money where you choose and deciding what government programs (if any) you wish to take part in. The purpose of the law is justice, not charity. The income tax is the most degrading and totalitarian of all possible taxes. Its implementation wrongly suggests that the government owns the lives and labor of the citizens it is supposed to represent. Tellingly, “a heavy progressive or graduated income tax” is Plank #2 of the Communist Manifesto, which was written by Karl Marx and Friedrich Engels and first published in 1848. The income tax is immoral on many levels. It permits the government nearly unlimited access to the people’s wealth. It opens the door to inquisitorial intrusion into their private affairs. And it introduces such complexity into the law that everyone is a potential criminal. the 16th amendment has enabled government to expand far beyond its proper constitutional limits, regulating virtually every aspect of our lives. It has given government a claim on our lives and work, destroying our privacy in the process. It takes billions of dollars out of the legitimate private economy, with most Americans giving more than a third of everything they make to the federal government. This economic drain destroys jobs and penalizes productive behavior. The ridiculous complexity of the tax laws makes compliance a nightmare for both individuals and businesses. All things considered, our Founders would be dismayed by the income tax mess and the tragic loss of liberty which results. Our taxpayer money has been used to bail out big banks, huge car companies, bailing out government housing programs and on huge stimulus bills that have done absolutely nothing to stimulate our economy. There is no better economic stimulus than letting people keep their money and spend it how they see fit. We CANNOT cut out the income tax if we want a welfare system, if you want the entitlement system to continue, if you want corporate welfare, the military industrial complex and foreign adventurism and policing the world. In fact, not only do you need the income tax, you need to borrow, you need to print the money which is exactly what we are doing now. It’s an attitude about government and I think the most important question that we have to ask, is what should the role of government be? The founders asked that question, they didn’t like the role of the King and they changed it and tried to give us a document, they made an effort to try to restrain us from going back to these old habits again and that’s the question we have to answer. If we had the proper role of government, if we just basically follow the constitution, we wouldn’t even have to have an income tax at all. We would live within our means and we wouldn’t be able to print money and we wouldn’t be able to borrow like we do. I choose to be a U.S. Citizen and obey the laws of this country. But I also believe it is my duty as one, to stand up and use my voice when I see injustice.